PSMSO Model Defense Attorneys - Oberheiden, P.C. A recent trend in structuring physician-based healthcare deals is the so-called Physician-Syndicated MSO-Model (“PSMSO”). In contrast to well-respected traditional management services organizations, PSMSOs are based on the suggestion that physicians “manage” companies by providing a plethora of atypical physician “services” such as billing, accounting, marketing, and recruiting. This brief article — co-written by long-time federal prosecutors in charge of healthcare fraud — will argue that PSMSOs are inherently flawed, both in fact and in law, and may not withstand law enforcement scrutiny. Dr. Nick Oberheiden has successfully represented physicians and healthcare executives in investigations before the Office of Inspector General (OIG), the Department of Defense (DOD), the Department of Justice (DOJ), the Department of Labor (DOL), the Department of Health and Human Services (DHS), the U.S. Postal Inspection Service (USPIS), the IRS, the FBI, the DEA, and the U.S. Secret Service. Physician-Syndicated Management Services Organizations (PSMSO) were created to mitigate the risks associated with physician self-referral laws. The creators of this model argue that because physicians do not own the pharmacy or toxicology laboratory to which they refer business, their referrals are immune from Stark Law and better protected from Anti-Kickback analysis. However, the PSMSO model is flawed and its implementation is problematic. The viewpoint that PSMSOs are immune from legal regulations is short-sighted and unconvincing in light of the close contractual, percentage-based relationship between PSMSOs and affiliated pharmacies and laboratories. In the PSMSOs reviewed by the authors, physicians arguably do have a financial interest in their referrals, and the service fees charged by the PSMSOs are nowhere near fair market value. The truth is that physicians — busy enough running their own practices — do not “manage” pharmacies and do not provide meaningful “services” to laboratories. Physicians should therefore be on alert that their distributions from PSMSOs for providing such services could be considered illegal kickbacks. Those PSMSOs reviewed cloud their operating agreements in an air of legality and artificial emphasis of regulatory compliance. A closer look of those reviewed reveals that references to safe harbors (such as a 40%-60% structure) are designed to merely create peace of mind among PSMSO members. Investing physicians should make sure that offered documents do not contain the following flaws. 1. The physicians do not make meaningful contributions to the MSO. As the name entails, “service” is an inherent component of an “MSO.” However, it can hardly be said that any of the physician owners is seriously engaged in services other than referring business to the corresponding and affiliated pharmacy or toxicology laboratory. Physicians interviewed under oath will likely admit that they have not provided a single tangible service to the MSO, have not once been involved in meaningful corporate affairs, and have instead taken a passive investor position and delegated all distribution-justifying services to other professionals. Due to the risk of anti-kickback violations, the Office of Inspector General and the Department of Justice have repeatedly articulated great concerns about percentage-based compensation in Physician Joint Ventures and issued several Fraud Alerts on the subject. 3. The MSO compensation is not determined in accordance with fair market value. Although PSMSO operating agreements state that they reflect fair market value, they often don’t. In the samples reviewed, the PSMSOs charge astronomical service fees that lack any legal foundation. To be justifiable, fees should be calculated objectively and assessed by reputable third party CPAs. 4. The distributions to physicians may implicate the anti-kickback statute. If the PSMSO service fee does not meet fair market value and cannot be considered commercially reasonable, the question of kickbacks becomes a concern. That fear is compounded by the fact that investing physicians pay a nominal investment amount but receive strikingly disproportionate returns on their investments -— a classic red flag in Department of Justice kickback assessments. Pseudo-references to safe harbors and bogus 40%/60% structures do not reduce the regulatory risk once the fair market value analysis fails. 5. Ownership and management of the PSMSO and its contracting pharmacies and laboratories overlap, and arm’s length negotiations and corporate formalities only exist on paper. The requirement of entirely separate and distinct ownership and management of the PSMSO and its contracting pharmacies means that any overlap of ownership between the PSMSO and the pharmacy could ruin the deal. To ensure independence and an actual arm’s length negotiation of appropriate service fees, law enforcement agencies will also expect that the PSMSO and the affiliated pharmacies are represented by different law firms. To dodge federal scrutiny, PSMSOs purposefully carve out federally funded business. However, contrary to common belief, the mere carving out of federally funded program patients does not mean that the business cannot be subject to federal law enforcement review. This is even more true in the context of pharmacies and toxicology laboratories, which are inherently subject to federal scrutiny (“CLIA” and “DEA” and “Controlled Substances Act”). The following is an abbreviated enumeration of possible grounds for federal jurisdiction despite carve-outs. PSMSOs are offered as federal securities via Private Placement Memoranda. Some of the PPMs reviewed, however, failed mandatory registration with the Securities and Exchange Commission (SEC) or proper notice of Form D filings and therefore operate inconsistently with federal law. The Office of Diversion Control, a branch of the Department of Justice (DOJ) and the Drug Enforcement Administration (DEA) enforce the Controlled Substances Act (CSA), a federal statute. CSA audits may require pharmacy owners to disclose all corporate documents including but not limited to contracts with physicians, physician consulting agreements, marketing agreements, and the like (e.g. MSO relationships) to federal authorities. The Office of Inspector General (OIG) has responded to federal carve-outs by investigating commercial laboratories and pharmacies for their accidental processing of federally funded patients. Indeed, some patients that appear to have commercial insurance coverage only, do, in fact, have a non-obvious supplemental Medicare or Tricare plans, thus invoking original OIG jurisdiction. By sending physicians questionable distribution checks via mail, the MSO may commit mail fraud, a federal felony under 18 U.S.C. § 1341. By submitting erroneous bills electronically, the MSO may commit wire fraud, a federal felony under 18 U.S.C. § 1343. The physician has a DEA license and therefore subjects himself/herself to federal rules; the affiliated pharmacy or toxicology laboratory has a Medicare or Tricare number and a CLIA license issued by the Centers for Medicare and Medicaid. Not all participating physicians may be from the issuing state and the MSO or the pharmacy/laboratory may engage in interstate commerce, which creates original jurisdiction for federal authorities. The same rationale of interstate commerce applies to commercial insurance carriers that are located out of state. The risk is real. In fact, several branches of the Department of Justice are responding to federal carve-outs by prosecuting healthcare entrepreneurs and companies under federal statutes for DEA, SEC, and kickback violations..
We believe that the physician’s exposure in PSMSOs can be substantial. The monetary volume generated by PSMSOs and affiliated ancillary services make PSMSOs attractive targets for FBI and OIG agents. Deviations from legal standards as grave as noticed in some of the reviewed PSMSOs could trigger civil or criminal prosecutions or medical board actions against PSMSO participants. Depending on the PSMSO structure, executives and physicians could be subject to False Claims Act, Stark Law, and kickback prosecutions. Healthcare Fraud is investigated by the Office of Inspector General (OIG), the Department for Health and Human Services (HHS), the Department of Justice (DOJ), and the Federal Bureau of Investigation (FBI). To minimize their exposure, physicians should request the following documentation and compliance certifications. 1. Documentation of an independent fair market value analysis that was issued prior to the PPM release and that concluded that the service fee between the MSO and affiliated pharmacy, lab, implant company etc. reflects fair market value. 2. Detailed documentation of each of the MSO’s past and ongoing efforts to meet all of the eight elements of the safe harbor it relies upon. 3. Documentation that proves that the syndicated MSO has been registered with the SEC at the time of its formation. 4. Documentation that the MSO is not engaged in interstate commerce. 5. Documentation of concrete actions that demonstrate the company’s intent to comply with state and federal law. 6. Documentation that the affiliated pharmacy, lab etc. has passed self-audits, is current with its compliance requirements, and is current with its CLIA and similar licenses (for pharmacies: request a DEA Diversion Control analysis). 7. Documentation in form of a written certification that the affiliated pharmacy, laboratory, blood testing, implant company etc. has never once paid commissions to marketers for bringing in federal payor business. 8. Documentation in form of a certification that the MSO and the affiliated pharmacy, lab etc. are represented by different law firms to ensure that the non-negotiable compliance requirement of an arm’s length transaction is met. 9. Documentation of all shareholder meetings conducted according to the MSO company agreement, including minutes and attendees. 10. Documentation in form of a statement from the Chief Compliance Officer of the MSO that certifies the entirely of the company’s compliance efforts. 11. Documentation in form of a written statement that the affiliated pharmacy, lab etc. has never once processed a sample, script, or referral that has a federal payor (as primary or secondary coverage) to ensure that service fees paid to the MSO and distributed to the physicians have not, directly or indirectly, been derived from Medicare, Tricare, Medicaid, federal workers’ compensation, or other federal healthcare programs. What Is Your Exposure Level? Physicians should take precautions to not become targets of FBI or medical board investigations. 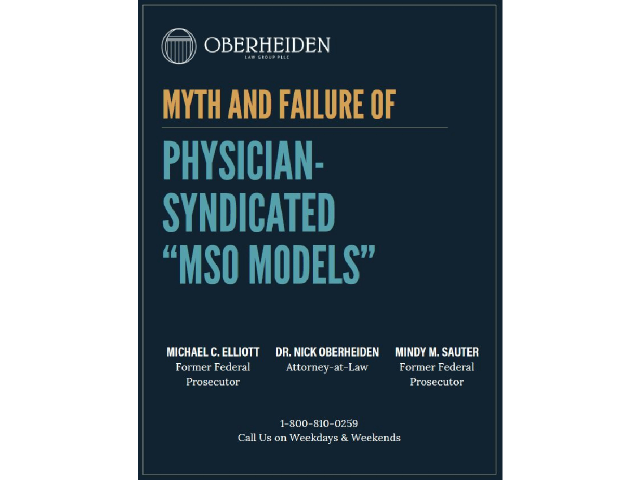 If you are a physician invested into a Physician-Syndicated MSO, you should contact an experienced healthcare fraud defense attorney for a free and confidential risk assessment. The attorneys of Oberheiden, P.C. are among the country’s most demanded Healthcare Fraud Defense Attorneys. Our enormous experience in healthcare investigations — both as senior government officials as well as innovative defense attorneys — and our long and distinct track record of dismissals, has made us attorneys-of-choice for clients from virtually all sectors of the healthcare industry. Among many others, we have successfully represented physicians, pharmacies, compound pharmacies, toxicology laboratories, DNA testing facilities, DME companies, physician syndications, MSOs, and healthcare executives in fraud investigations spanning the entire United States. If you believe you are under investigation or if you want to preemptively ensure that your business stands on a firm, solid, and safe foundation, you should speak with one of us directly. Call us and speak directly to one of the attorneys at (800) 810-0259.